ShredIt can be configured to comply with more than one standard at the same time. Here’s a few things you show know. ShredIt X can be configured to comply with the US Department of Defense 5220 shredding standard. Keep in mind that ShredIt X is always compliant to the US Department of Defense 5220 Clear shredding standard. The DoE approved procedure is to overwrite all locations 3 times – twice with a pseudo-random pattern, and then overwrite all locations with a known pattern. Since erasing with this standard requires 3 passes, it will take longer. Since erasing with this standard requires multiple passes, it will take longer. ShredIt X can be configured to comply with the Gutmann shredding standard. Please don’t use an excessive number of overwrites. For several years people have misinterpreted the Gutmann paper and thought they need 35 overwrites. This so frustrated Gutmann that he amended the paper to clearly state that he meant there were 35 ways to overwrite and not that 35 overwrites were required. Using such an excessive number of overwrites serves only to slow down the process and provides no extra protection. We only provide this option for marketing purposes (to say “we have it too” on side by side product comparisons) and we do not recommend the use of 35 overwrites at any time. From the “ShredIt X” preferences dialog, check the appropriate check box to enable standard’s compliance.Default value is “off”. To enable DoE Standard compliant shredding, tick the “DoE” checkbox. From the Final DoE Pattern menu, pick a final pattern. To enable Gutmann compliant shredding, change the “Number of Overwrites” preference to “35”. 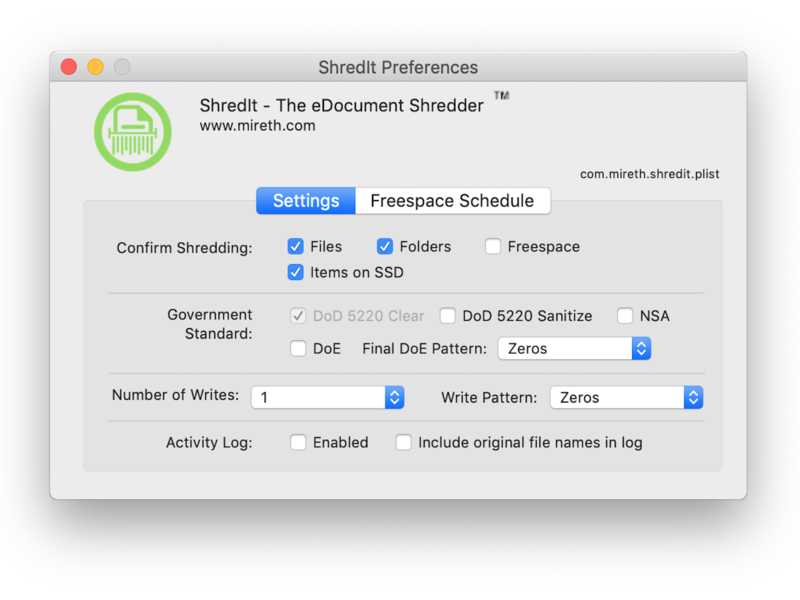 ShredIt X provides a way to check what was shredded. This is particularly useful if shredding is going to take a long time and you don’t want to watch the entire operation. From the shredding preferences, enable the Activity Log. Perform the desired shredding operation. ShredIt X provides a way to confirm before shredding. This is particularly useful when you first use a shredder, since once an item has been shredded, it cannot be recovered – even by us. From the shredding preferences, enable “Confirm Shredding”. Each time you try to shred a file, folder or freespace, you will have to confirm before shredding will take place. Shredit offers a Safe Place™ feature to ensure that an item is not accidentally shredded. Any item put in a folder named Safe Place will not be shredded. If you try to shred an item inside a Safe Place folder, ShredIt will display a dialog box informing you that you need to move the item out of the Safe Place. Once you have moved it out of the Safe Place folder, you can shred the item. When you create a Safe Place folder, test it to make sure ShredIt will not shred the contents before putting important items in it. Create a folder called Safe Place on your computer. Test it to ensure you named the Safe Place folder correctly. Create a new Untitled folder or document of any kind and drag it into the Safe Place folder. Then drag the new item from the Safe Place folder onto the ShredIt icon. ShredIt should display a dialog box informing you that you need to move the item out of the Safe Place to shred it. When you click the OK button ShredIt will quit. When ShredIt has quit, check the contents of the Safe Place folder you created. Your test item will still be there. If the test item is still in the Safe Place folder, then you have named the folder correctly and Safe Place is enabled. Delete the test item and continue. If the test item is not in the Safe Place folder, then you have not named the folder correctly and the contents of the Safe Place are not safe from ShredIt. Repeat Step 2 until the test item is not shredded. Drag the items you want to protect against accidental shredding into the SafePlace folder. As long as the items are in the SafePlace folder, they are protected from accidental shredding. If you want to shred an item that is in a SafePlace folder, you must drag it out of the SafePlace folder first. If you want to shred a folder that contains a SafePlace folder, you must move the SafePlace folder out of the folder. If you want to shred a SafePlace folder, you must rename it something besides SafePlace. Important note: What distinguishes an item as “Not to be shredded” is its location in a folder named “Safe Place”. If you move the item out of the Safe Place folder, it is no longer protected from accidental shredding. If you rename a Safe Place folder something else, its contents are no longer protected from accidental shredding. The SafePlace folder is designed to protect your data from being accidentally shredded. Don’t move your System Folder there. An item within a SafePlace folder is protected from shredding no matter how far up or down in the directory structure the item is from the SafePlace folder. A Safe Place Folder is contained within Folder X. Folder X contains Folder A, File B and SafePlace Folder. Folder X cannot be shredded because it contains a Safe Place Folder A. File B can be shredded. Folder A can be shredded. A Safe Place Folder contains Folder C and File D.
Folder C and File D cannot be shredded because they are in a Safe Place.